What The Heck Are We Doing Today? I am giving you links to two GREAT posts on I Love Typography about making your own FUNCTIONAL FONTS. Hmmm...there is a change in the air. Since using tumblr this quarter I have discovered that I like blogging over there a bit better. Please follow the 254 tumblr. I probably will be posting assignments, links and also reblogging your good posts too! also, please enable comments on your tumblrs...you can do this in the settings. I can also show you in class tomorrow too. Please download Download Theartofthepencilcomp . 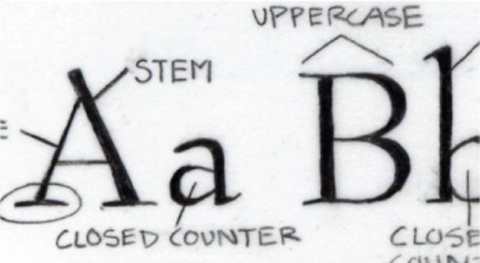 Here is a good site for learning the Anatomy of Type! DUE ---> Moodboard/Research/concept. Post to the flickr discussion group what you are thinking about doing. Please bring in all research and ideas and we will work more on this in class. I would like to hear and see sketches of at least five different concepts. IN CLASS EXERCISE ---> Type Comping and Anatomy. BRING A DRAWING UTENSIL! LOOKING & TALKING ---> We will be sharing our ideas with each other about your handmade typefaces. READ ---> Importance Of Comping Type. Respond in the flickr discussion area. Materials Needed: tracing paper (provided), masking tape, pencil and a ruler. I have a page from "Getting It Right With Type" ready for you to trace. Trace over and fill with pencil. Pay attention to detail and the craft and placement of your marks. Identify the vocabulary words to the correct character parts. This project is due Tuesday, April 6th. Sister Corita Knows What is UP. My graphic design professor in college handed me the above list of rules on my very first day of graphic design one class. I still have this piece of paper almost 13 years later. Sister Corita is the creator of this list...she was an educator, artist (check out her screen prints! ), activist and nun!!! Read more Here, Here, Here, Here and watch the video below. Also, go and watch Beautiful Losers. 5. make moodboards and concept sketches for your typeface. Post process to flickr. A Tumblr is a easy to update blog, tailor made to act as a scrap book of images, movies, audio and quotes. It plays nice with long-format original text too. I am requiring 254 students to keep their own Tumblr blog as a means to document visual discoveries while doing research, to serve as a repository for reading responses, and a place to hold your thoughts, observations and process about your projects. Pick TEN typefaces that you are intrigued by. These don't have to be your ten favorites in the universe, but ten that you simply like or want to learn more about. Please look through the list of Type Foundry Links from the site Designing with Type and also look through the typefaces in your fontbook. Take your time and look at faces. The objective of this exercise is to have you look at MANY examples of typefaces and to force you to make decisions about styles that you enjoy. Upload your examples to your tumblr! Treat tumblr as a visual archive for type examples that you love. REMEMBER to link back to where you originally found the image that you are uploading. Look at Handmade Fonts, Friends of Type, Typophile opening credits, Sweet Treats Cookbook, Sagmeister, Daily Drop Cap, Marian Bantjes, Jessica Hische. Hairy alphabet by Craig Ward. Office clip shadow alphabet by Dave Wood. You will be creating an experimental typeface design (3/d or mashup of two faces - like cutting up helvetica and cross breeding it with didot to make helvitot babies). Or you may choose to make your face completely modular (based on shapes and oh so analytic). The second part of the assignment requires you to create a promotional campaign with deliverables advertising the typeface. Please click on the following helpful typography links and familiarize yourself with GOOD TYPE. One of the easiest ways to start learning about Typography and getting comfortable with Typography is to start LOOKING at great examples of Typography. Type is everywhere and a lot of it is bad. I don't want you to be making or using bad type. Start reading and soaking in the good type on these links. Required: Perfect introduction to why you should love type. Required: Excellent overview of RULES. Great reference. Required. If you are serious about becoming a graphic designer you will have this on your shelf. Recommended: Super gorgeous and excellent visual historical overview. Recommended. Wonderful little book focusing on the creation of letter forms. Recommended. Great for beginning grid and non traditional grid ideas and examples. Recommended. Great for intro to the grid. Recommended. We will be reading from this book.